New in New jacket. 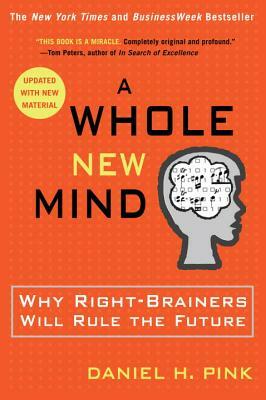 Whole New Mind, A. The brain is divided in two halves. One half processes logical problems and is sequential, the other is conceptual processing in parallel ideas and patterns. Mr Pink's thesis is that most logical processes can be done better with a computer and over time will be. Conceptual processes such as design and artistic appreciation are better done by man. In addition, the areas of conceptual thinking and design are becoming the differentiation between products and ideas. Thus, while left brain thinking is still required, the premium will be paid for those who can combine both halves of the brain in developing solutions to the world's problems. This book is designed for left-brainers and right-brainers; firstly, to help logical thinkers try to understand (and become) more creative, and, secondly, for creative thinkers to finally receive some credence in the business world (and life)! Pink is someone who realizes that businesses are craving creativity and not just computer-like clones in order to compete in today's marketplace. Valuable insights and methods are shared which help us to understand and activate our creative (right) side of the brain. Excellent reading and a must for business managers! Your next book could be this one - sifting for eons, I'm now 70 - for a manual for this body and trying to parse what I know with what the culture dictates THIS book fits neatly with ALL the teaching modalities about our human equipment! The right side of the brain makes sense for our ways of seeking out spirituality and jobs! It is downright FUN! Pink has found the new frontier. Take it from one who has recovered from growing up in suburbia by living off-grid by a national forest, on a farm, and now in a village; who has survived woeful marriages, whose father was a lapsed Jesuit priest and mother from an immigrant Dutch family; who has made pilgrimages to several continents. Who found love at age 69.